Hamilton Fish, a lawyer, was U.S. Secretary of State from 1869 to 1877 during the administration of President Ulysses S Grant. He had earlier served as Governor of New York State for the two years 1849 and 1850, and was a U.S. senator for six years from 1851. [Hamilton Fish] graduated from Columbia College in 1827. He was admitted to the bar in 1830, but early turned his attention to political affairs. He became prominent in the Whig party. In 1842 he was elected to the National Congress from the Sixth New York District. 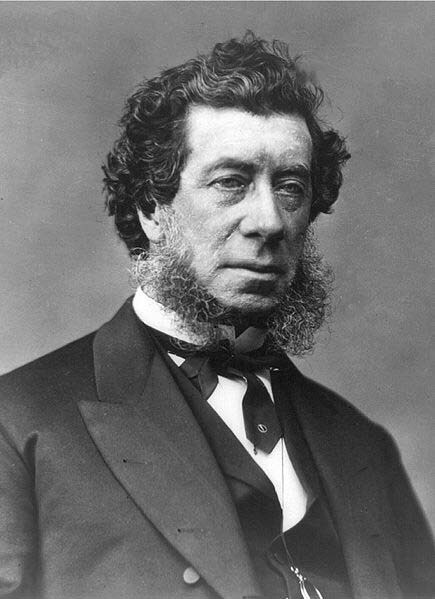 In 1846 he was the nominee of his party for the office of lieutenant-governor, with the Hon. John Young as candidate for governor. Although the head of the ticket was elected, the opposition of the anti-renters, whose plans Mr. Fish emphatically condemned, prevented his election. His successful competitor, Addison Gardner, soon resigned the office to accept the position of judge of the Court of Appeals, and Mr. Fish was elected in 1847 in his place. In 1848 Mr. Fish was elected governor of the State by a plurality of nearly 100,000, and in 1851 was chosen United States Senator and served for six years, following which he made an extended tour of Europe. While he was in the Senate, the Republican party was organized, and Governor Fish, as he was always called, became one of its loyal supporters. On the outbreak of the Civil War he took a decided stand in defense of the Union and attained a commanding influence. In 1862 President Lincoln appointed him a member of the Commission to visit the Union prisoners confined in Richmond, with a view to obtaining an exchange, which was eventually effected. He was also chairman of the Union Defense Committee. In 1869 he was called to the cabinet of President Grant, holding the high position of Secretary of State for eight years. Through his skillful and untiring efforts a peace settlement of the Alabama claims was made, through the Treaty of Washington in 1871 and the subsequent Geneva Arbitration in 1872. He became president general of the Order of the Cincinnati in 1854, and so continued until his death. He was also president of the New York Historical Society, of the Union League Club, and of the United Railroad and Canal Company of New Jersey, and from 1859 until 1893 chairman of the board of trustees of Columbia College. Governor Fish served repeatedly as a delegate from the Diocese of New York to the Triennial Conventions of the Protestant Episcopal Church and devoted much of his time to the study of and became an authority in respect of the canon law of the church. After a long, extremely active, and useful life, Mr. Fish passed away at the age of eighty-five years, on September 7, 1893, at his country seat, "Glenclyffe," near Garrison, in Putnam County, New York, leaving behind him the memory of a patriotic citizen and an upright, able and honorable man. Mr. Fish built and for more than forty years lived in a house at the corner of Second Avenue and Seventeenth Street, fronting on Stuyvesant Square, the land occupied by which public park had been given to the city by his uncle, Mr. Peter G. Stuyvesant. The site of Mr. Fish's house and garden is now that of the Maternity Hospital. His country seat, "Glenclyffe," embraced the famous "Beverley House," which had been the headquarters of General Benedict Arnold at the time of the detection of his treason and from which he had fled to the British. See also Wikipedia, Hamilton Fish. Charles Weygant, The Sacketts of America, "791. Hamilton Fish, b. Aug. 3, 1808, d. Sept. 7, 1893; m. Julia Kean." Stuyvesant Fish, Ancestors of Hamilton Fish and Julia Ursin Niemcewicz Kean, His Wife, (Online image. WorldVitalRecords. From the Quintin Publications Collection) (1929), pp. 48–50. The New England Historical and Genealogical Register, NEHGS, Boston, volume 78 (1924): 434-6, "He married in New York City, 15 December 1836, Julia Kean, born at Ursino, near Elizabeth, N.J., 19 December 1816, died in New York City 30 June 1887, daughter of Peter and Sarah Sabina (Morris) Kean of Ursino." Stuyvesant Fish, Ancestors of Hamilton Fish and Julia Ursin Niemcewicz Kean, His Wife, (Online image. WorldVitalRecords. From the Quintin Publications Collection) (1929), pp. 48–50, has 17 December 1836.